This reading group explored the relationship between portraiture and illness, and was led by the artist Tim Wainwright. It met on Thursday 23 March, 3-4.30pm in Room BO2, Birkbeck School of Arts, 43 Gordon Square WC1H 0PD. Tamar Tembeck, ‘Selfies of Ill Health: Online Autopathographic Photography and the Dramaturgy of the Everyday’, Social Media + Society, 2:1 (2016) (available online or via the Reading Group’s shared Dropbox folder: for further details of how to access, please contact Heather Tilley). He is currently completing a quartet of works that have explored what he considers to be the four elements of being human: mind, body, heart and soul. With regard to this he has chronicled the lives of the severely mentally ill, of people with cancer , of people going through heart transplantation and is now examining what soul means to a variety of Londoners in their everyday lives. “Far from being made into mirrors for his own fears, his subjects are allowed to ‘speak’ for themselves. His interest isn’t in showing the differences in their self-image but simply in observing that each of them has a self-image.” (Charles Darwent). The Birkbeck Medical Humanities Reading Group aims to create a space in which academics, clinicians and students can come together to explore key readings, ideas and materials in the field of medical humanities. Our endeavour is to find ways of talking across the different disciplines of the humanities and medicine, and we welcome participation from colleagues interested and engaged in these areas. For details of previous sessions, please click here. 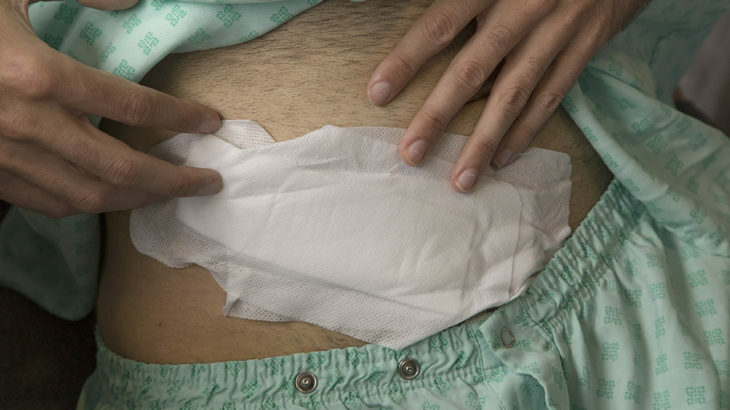 Images: Jonny’s Bandage, from Tim Wainwright, Transplant. Events Birkbeck, medical humanities, portraiture. permalink.